Many problems at the forefront of science, engineering, medicine, and the social sciences are increasingly complex and interdisciplinary due to the variety of data sources and computational methods available today. Such problems often involve large amounts and diversity of data - which must be channeled through computational services to yield insights. Such data is increasingly large-scale and distributed; the datasets, their locations, and associated scheduling decisions are time-dependent. Increasingly, such data is also "dynamic" - i.e. it is dynamically generated through scientific instruments or specialist sensors, and the raw data is often non-persistent. Workflow techniques have been used extensively in scientific applications to aggregate data processing and computational methods - however, such workflow systems are often limited when dealing with such large-scale, dynamic data. This talk will identify a number of scientific applications that generate or use dynamic data. Subsequently, computational resource management strategies that may be used in such applications are outlined. Some of these strategies require modifications to the network substrate that connect distributed services, whereas others can be supported within the service management platforms themselves - all of which may be adopted within a workflow enactment engine. Challenges in achieving will be outlined. 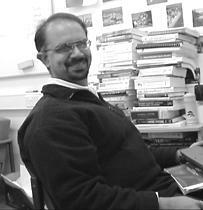 Omer Rana is Professor of Performance Engineering at Cardiff School of Computer Science & Informatics. He was formerly the deputy director of the Welsh eScience Centre at Cardiff University -- where he had an opportunity to collaborate with a number of scientists working in computational science and engineering. He holds a PhD in "Neural Computing and Parallel Architectures" from Imperial College, London University. His research interests are in the areas of high performance distributed computing, data mining and analysis and multi-agent systems. Prior to joining Cardiff University he worked as a software developer with Marshall BioTechnology Limited in London, working on projects with a number of international biotech companies, such as Merck, Hybaid and Amersham International. He is an associate editor of the ACM Transactions on Autonomous and Adaptive Systems, series co-editor of the book series on "Autonomic Systems" by Birkhauser publishers, and on the editorial boards of "Concurrency and Computation: Practice and Experience" (John Wiley) & Journal of Computational Science (Elsevier).